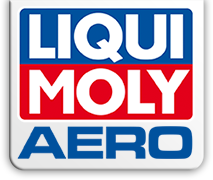 With products of the LIQUI MOLY AERO product family you will enjoy the improved technical and optical condition of your aircraft. Already during the early product development phase we were able to profit from the valuable know-how and knowledge of active pilots. Thanks to this, the products suit perfectly their field of application. We do not only offer you the modern products for GA-Aircraft, we are happy to also inform you and keep you updated on latest tests, activities and news in this range of products. After months of development, innumerable test for further improvement and numerous real flights we now offer modern, incomparable maintenance and safety products. According to this, all standards were set on the top level! Starting with the development, to the production and finally the filling – the whole process takes place on highest level exclusively in Germany. A real product family "Made in Germany".